You’ll get a sense of the remoteness of outback Australia as you travel to Kings Creek Station. Watch as the local wildlife wakes for the day – dromedary camels, kangaroos, brumbies and dingoes. This cattle and camel station covers 1,800 square kilometres. Relax in the café where you’ll be treated to a cooked breakfast. Their coffee is said to be the best in the Territory! Deep down between sandstone cliffs, is the Garden of Eden – a true oasis. Here is a natural spring waterhole surrounded by local and exotic plants and trees such as gums, bonsai looking trees and enormous prehistoric ferns, creating a truly unique landscape. The Creek Bed Walk is ideal if you’re interested in something more relaxing. After leisurely taking in the sights, set off on a two kilometre stroll along the creek bed, that leads to views of the impressive canyon rim. 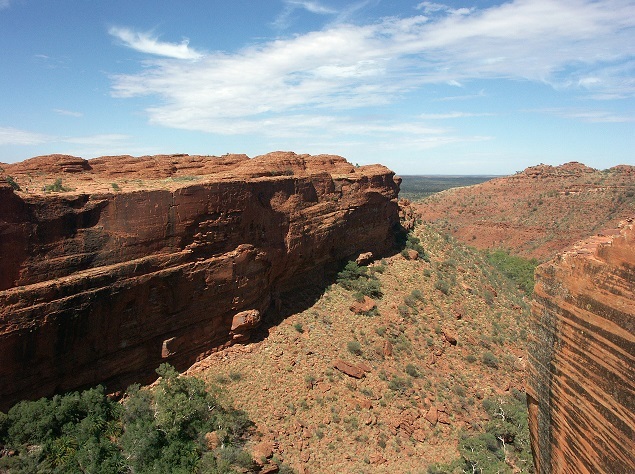 Now we’re off to Kings Canyon Resort – an oasis in the outback! Treat yourself to lunch (own expense). To see Kings Canyon from above, take an optional scenic helicopter flight (creek bed walkers only), or bring your swimmers if you’d like to take a dip in the resort’s pool. Enjoy amazing outback scenery as we head back to Ayers Rock Resort (or if you prefer we can arrange for you to continue to Alice Springs for your drop off for an additional $54pp). Child rates apply 6-15 years. Nil refund if bookings cancelled less than 48 hours prior to travel.